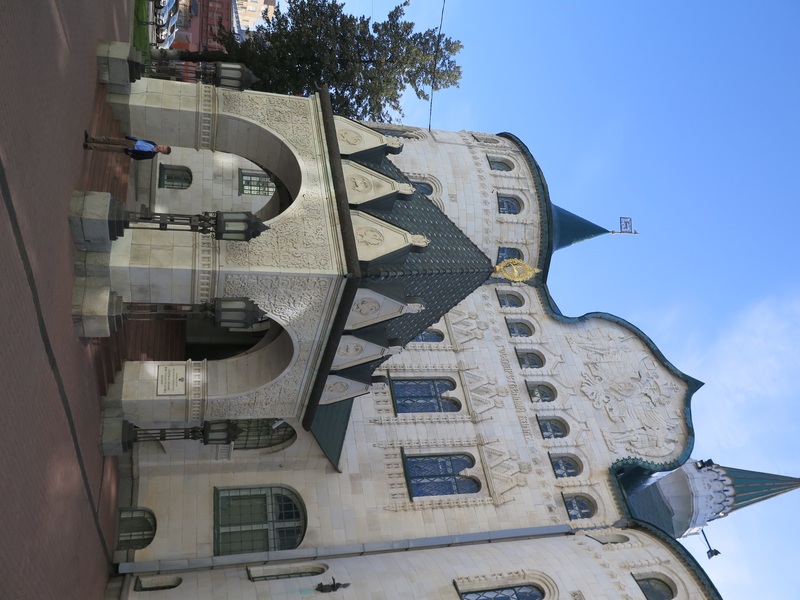 We were only in Nizhny (as my guidebook tells me the name is frequently shortened–not sure if that’s true, but it’s easier to type at least) for a few hours, en route to Vladimir, where we’ll spend the night. So when we arrived, we found lockers for our bags (figuring out how they worked as an adventure in itself), and then went off in search of a bus from the train station to the town. Near the train station, Nizhny is ugly. There’s really no other way to say it. The train station itself is also rather unattractive–a weird mix of mid-century soviet and modern–and when you exit the station the city feels dirty and confusing. We also had a hard time figuring out where to find a bus to the center of town, where the Nizhny Novgorod Kremlin is located. Other places we’ve been there have been friendly and helpful people all about; here we had a hard time finding clear instructions. Finally, we climbed into a crowded bus and were eventually dropped off near a central park. We stood there stupidly for a few minutes, pulling out our phones and activating GPS to try to determine where exactly we were in relation to where we wanted to be. Eventually, we found ourselves walking up a pedestrian street towards the Kremlin. And here’s where Nizhny started to feel a little less ugly, but a little more sad. The pedestrian street was full of some of the grandeur that we got used to in Kazan, but where buildings were beautiful and had some intricate facades, they were all crumbling. The city felt very poor; none of the grand buildings were being maintained. This building is one of many examples of elegant buildings in disrepair. 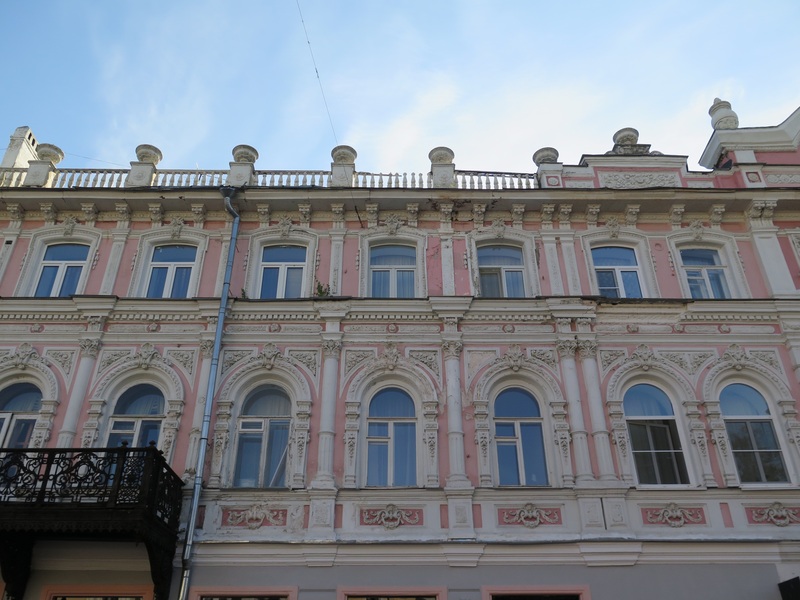 We had just left Kazan, which had many such buildings that were all perfectly maintained. Seeing the opposite here was striking. I don’t recall the official name for this building, but it was some sort of centralized bank authority. It was by far the grandest building we saw in our walks. Later in the day, one of the nice women we encountered whipped out a set of fancy post cards (“They’re very expensive,” she told us. “But I want to show you.”) that showed this building and its interior in all their glory. It is a truly, truly impressive thing. But is apparently closed to the public anyway. The only way to see it is in pictures. Nevertheless, we did enjoy our walk and shortly arrived at the Kremlin gates. Apparently, “kremlin” pretty much means fortress, and is the home of various governmental buildings. (Note: I type this without wifi, and haven’t actually looked it up. I’m making some less-than-educated guesses.) There we had some confusion figuring out what to see, but eventually found ourselves walking along the fortress walls (we paid a small amount for the privilege), shaded from the hot sun and enjoying views over the city and the kremlin compound as well. The wall we walked along. Our path along the kremlin wall. This is looking inward. 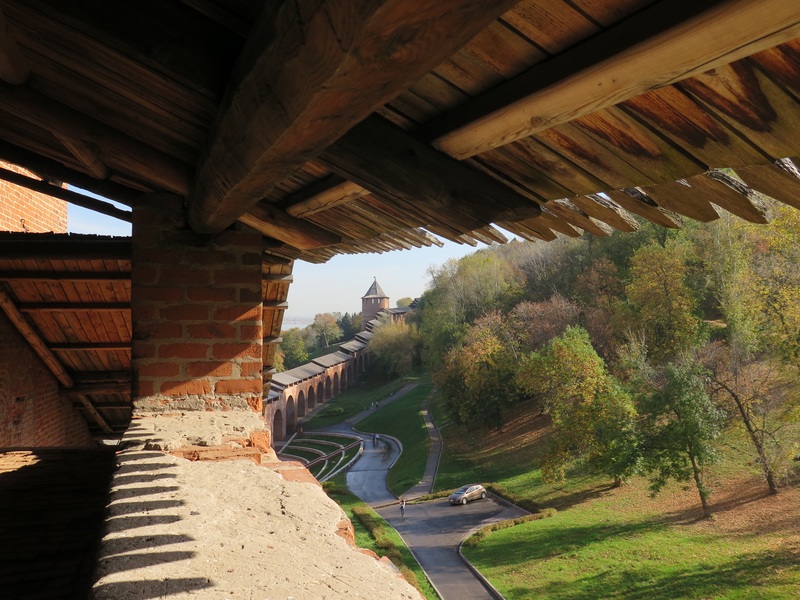 Looking out over Nizhny Novgorod from the kremlin wall. 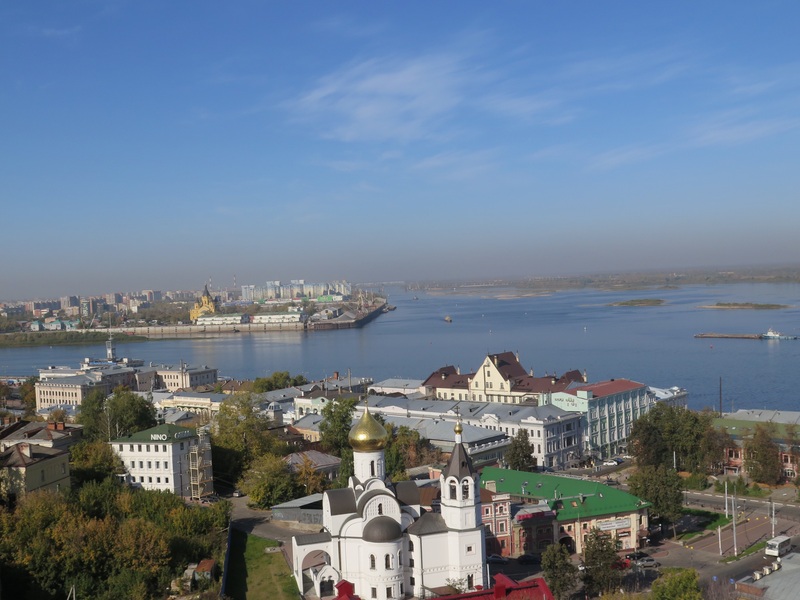 Nizhny is on the bank of the Volga. Every few towers along the wall there would be a small museum. These were truly third rate. And I’m being generous. There was one on the local flora and fauna, which was almost entirely about the local mushroom crops but did feature a couple of horrifying stuffed boars and what I think was a vicious wolf. Then there was one celebrating various wars, but I didn’t pay much attention on which wars they were. (Other than to note that the earliest mentioned was WWII.) After that, I really stopped paying attention. I just got my ticket stamped at the various stops and enjoyed the pretty views. 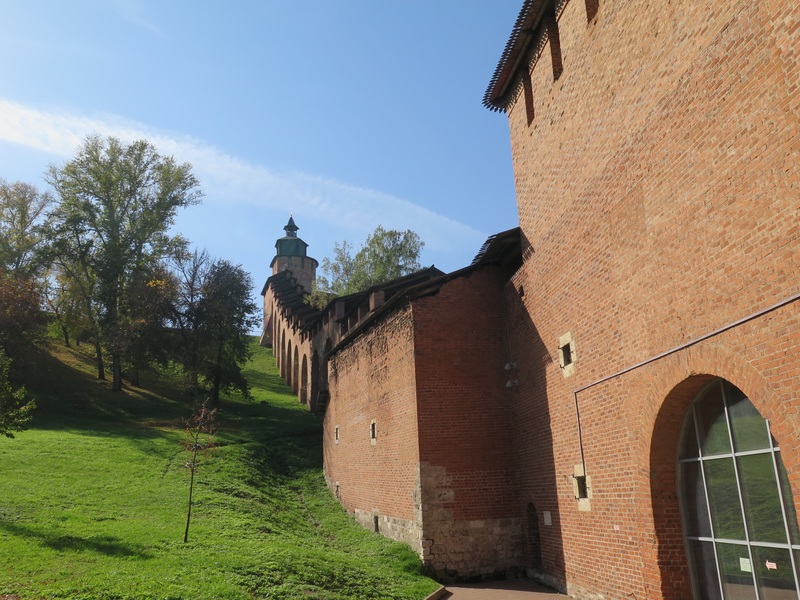 Walking around the Kremlin I started to appreciate Nizhny Novgorod a bit more. It really was lovely, high up on an embankment overlooking the vast expanse of the Volga river. There was a lot of green, and trees, and many interesting buildings and churches popping up here and there. There were also several very friendly ladies that we met in the museums, all of whom were happy to suggest walking routes for us. I’m not sure what this is, but I sure thought it was attractive. 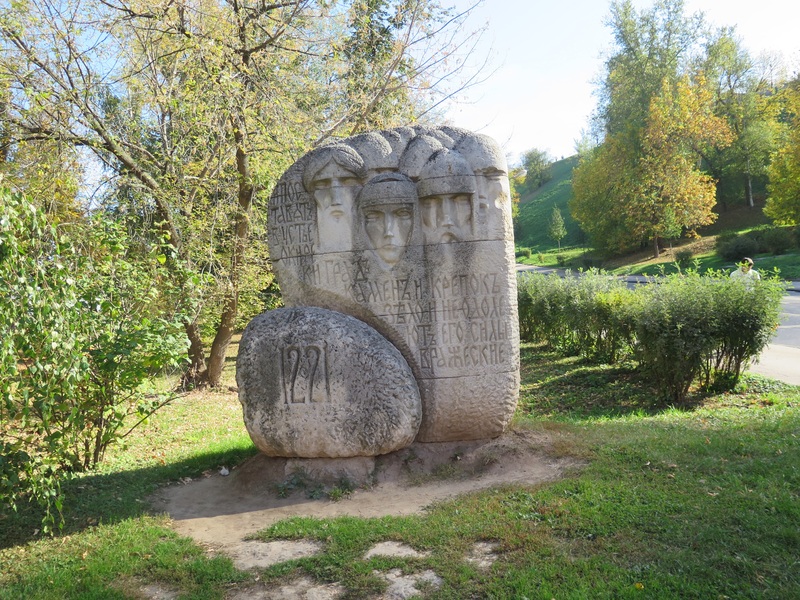 Not sure what this monument is to commemorate, either. After a few hours of wandering, we treated ourselves to a truly extravagant lunch. (I didn’t order the reindeer tongue, but will admit that I seriously considered it.) Our waiter, upon hearing where we were traveling from, asked, “What are you doing here?” And then we made our way back to the train station. We are now traveling first class on an express train that will drop us off in Vladimir before it ends in Moscow. It’s quite a nice train, although I’m not sure first class is all it’s cracked up to be. (Both Steve and I wonder if we wouldn’t have been more comfortable in 2nd class, though that was before the loud music stopped playing and the AC came on.) This isn’t a sleeper, though; it’s only two hours to Vladimir and three to Moscow. We will survive the fancy train! I find myself thinking of Nizhny as a sort of palate cleanser; a buffer between Kazan and what comes next. Suzdal (which we will access from Vladimir) is supposed to be amazing. I think I am more likely to enjoy Suzdal when I am comparing it to Nizhny rather than to Kazan. 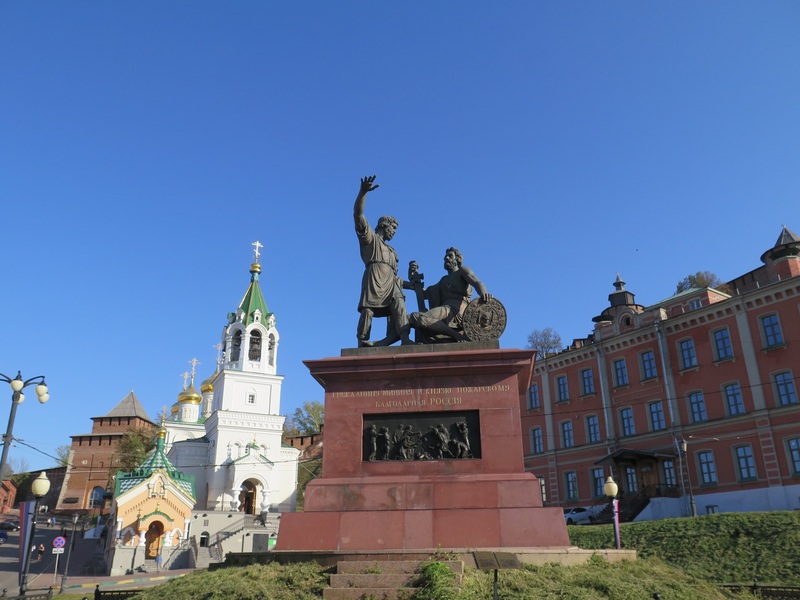 Edited to add: Steve talks about Nizhny Novgorod in Get me outta here!